The funeral service for Britain's last surviving World War I veteran Harry Patch who died aged 111 has taken place at Wells Cathedral in Somerset. Thousands of people lined the streets of Wells as his coffin was taken to the cathedral where the service was relayed on big screens to crowds outside. At the end of the funeral service two bugles sounded the Last Post. 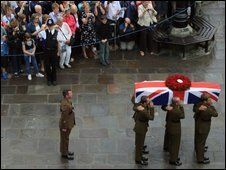 Mr Patch's coffin has been taken from the cathedral for a private burial in accordance with his wishes. 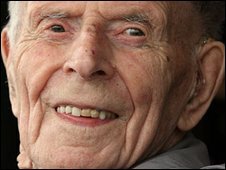 Mr Patch, who was born in 1898 in Combe Down, near Bath, died on 25 July at Fletcher House care home in Wells, Somerset, south west England. He was the last surviving soldier to have fought in the trenches during the Great War. At the time of his death Mr Patch was the oldest man in Europe, following the death exactly a week earlier of 113-year-old Henry Allingham, from East Sussex, who had been the world's oldest man. Representatives from the Belgian, French and German governments all took part in the service to show Mr Patch's respect for soldiers on all sides of the war. 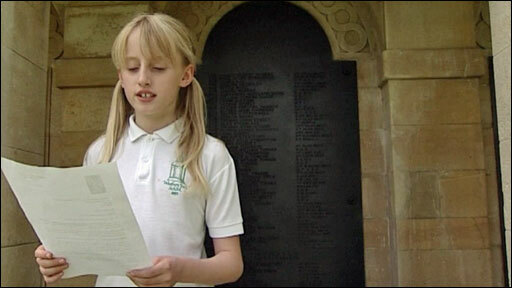 Marie-France Andri, Belgian Charge D'Affaires, read from Harry Patch's memoir The Last Fighting Tommy. Pensioner Jim Ross, speaking on behalf of Mr Patch's friends, said: "He realised he was one of a dwindling band and that as that band decreased in numbers, he was becoming more and more significant. With dramatic timing, the sky turned black and the heavens opened at the very moment Harry Patch's coffin emerged from Wells Cathedral. But, rather than dash for cover, the huge crowd on the Green outside stood perfectly still and applauded the hearse in the pouring rain. Wells is England's smallest city, but it didn't feel like that today. Thousands of people lined the narrow streets - six or seven deep in places. One thing that struck me was how young many of the mourners were here - teenagers, who are the same age as Harry when he was sent to the trenches. I spotted one young man wearing surfing shorts and a black tie. Harry would have smiled and approved. I was also struck by the number of people who had travelled here from across Europe. He wanted his funeral service to be about peace and reconciliation between nations. "He had the choice of either creeping away into the background or making his message known. "Harry knew that by speaking out, the memories would come back, the demons I call them, would come back to torment and torture him. "I believe they did, but I believe Harry made the decision because he wanted to get his message broadcast. "His prime message is that we should settle disputes by negotiation and compromise, not by war." Soldiers from four countries acted as pall bearers for the coffin which was applauded by crowds of people as it was driven through the city of Wells. Speaking during the service the Very Reverend John Clarke, Dean of Wells said: "Harry was an ordinary Somerset man, a plumber who tended his vegetable gardens, looked after his chickens but he became extraordinary, someone who was an icon for our nation and for western Europe." Veterans Minister Kevan Jones said: "Today marks the passing of a generation, and of a man who dedicated his final years to spreading the message of peace and reconciliation. "Active participation in the Great War is now no longer part of living memory in this country, but Harry Patch will continue to be a symbol of the bravery and sacrifice shown by him and those he served with." His great-nephew David Tucker, from Devizes, Wiltshire, said: "I feel extremely proud to have carried Harry's medals today. 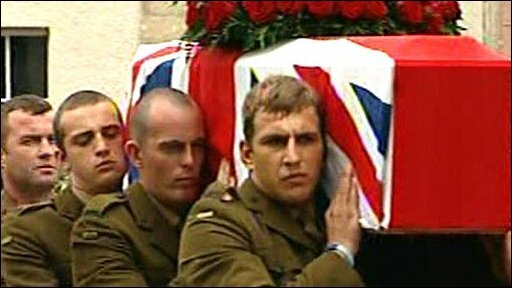 Mr Patch's coffin was carried by six private soldiers of the Rifles Regiment, the successor to Mr Patch's Regiment, the Duke of Cornwall's Light Infantry. Two soldiers from the armies of Belgium, France and Germany also took part in the funeral. The Ministry of Defence said the involvement of soldiers from France, Belgium and Germany symbolised Mr Patch's desire for reconciliation and his view that, "irrespective of the uniforms we wore, we were all victims". The Duchess of Cornwall and Duchess of Gloucester attended the funeral service. Mr Patch, who left school at the age of 15 to train as a plumber, was a machine-gunner in the trenches and served as a private from June to September 1917. He was married twice, first in 1919 in Hadley, Shropshire, to Ada - a marriage which lasted 60 years - and then to Jean when he was 81. From 2003 he had a third partner, Doris, who lived in the same care home and died two years ago.